Nearby campsites: County Park, just up the hill from the boat harbor. Comments: The Langely Boat Harbor has a reputation of never turning away a boat. 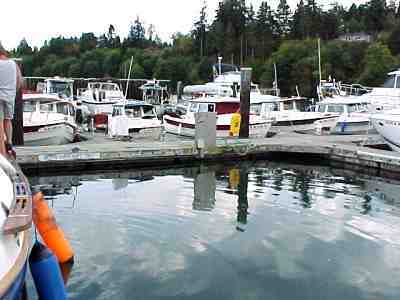 It is a marvel to watch Ben, the harbormaster, choreograph the dockings. Nice town for dining and shopping. 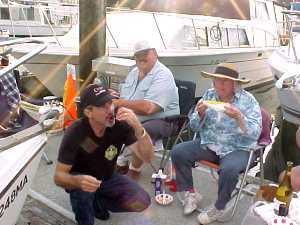 -----There were 6 boats at the Langley, including us in our Alaska camper. It was a congenial gathering of friends -- all with the shared interest of water and their C-Dorys. -----And food? 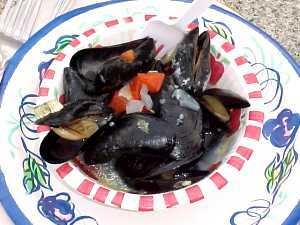 We had a feast of steaming hot bowls of just-harvested mussels (with a delicious garlic/onion, tomato/olive oil sauce) and clams, with a baguette to dip into the broth, white corn on the cob (picked fresh from Lizbeth and Roger's farm), and all washed down by good Snoqualmie Pale Ale or chardonnay. Dessert was berry or apple pie. The Romans had nothing on us C-Dory folk! ----- We sat and chatted on the dock, laughing and sharing, watching boats sashay in and out of harbor. 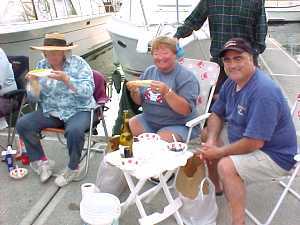 Our time together is the essence of what friendship and boating life is all about. We left with good memories shared. 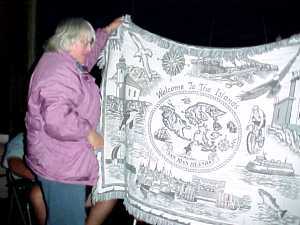 ----- 'Lisbeth and Roger presented a beautiful blanket to us to remember our good times in the San Juan Islands.